A nightclub, or club, is, as implied, a club more inclined for use as a place to dance and socialize, as opposed to more sexually oriented strip clubs. While strip clubs are more common in the GTA series, nightclubs are significantly rarer. 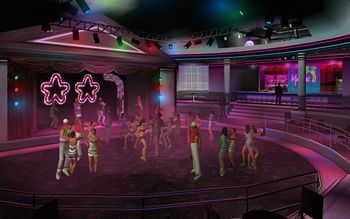 Grand Theft Auto: Vice City, Grand Theft Auto: San Andreas, Grand Theft Auto IV, The Ballad of Gay Tony, and Grand Theft Auto V are the only games to feature nightclubs as interactive locales. Gaydar Station, a gay-oriented club that also seemingly welcome straight people, in San Fierro. Frankie Knuckles' "Your Love" is usually played in the background when the player is not dancing. For songs played when the player dances, see this article. In Grand Theft Auto IV, nightclubs are not accessible and tend to be only named. Maisonette 9 in particular is occasionally mentioned in GTA IV media, while Bahama Mamas has a physical presence but is not accessible due to a temporary closure. 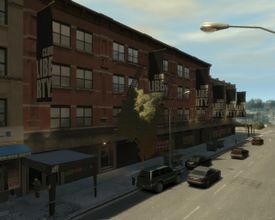 The only interactive club is Club Liberty, a semi-interactive club in Northwood, Liberty City, which serves as a bar where the player and a friend or girlfriend to can drink. Bahama Mamas, a competing club only accessible during "Boulevard Baby" and in multiplayer. Unlike their predecessors, nightclubs in The Ballad of Gay Tony exclusively open at night, and are thus inaccessible during the day. There is only one nightclub in GTA V, Bahama Mamas West. It is inaccessible by the player, but friends can be taken to the club during outings for drinks. Bahama Mamas West in GTA V.
This page was last modified on 14 March 2014, at 01:39.